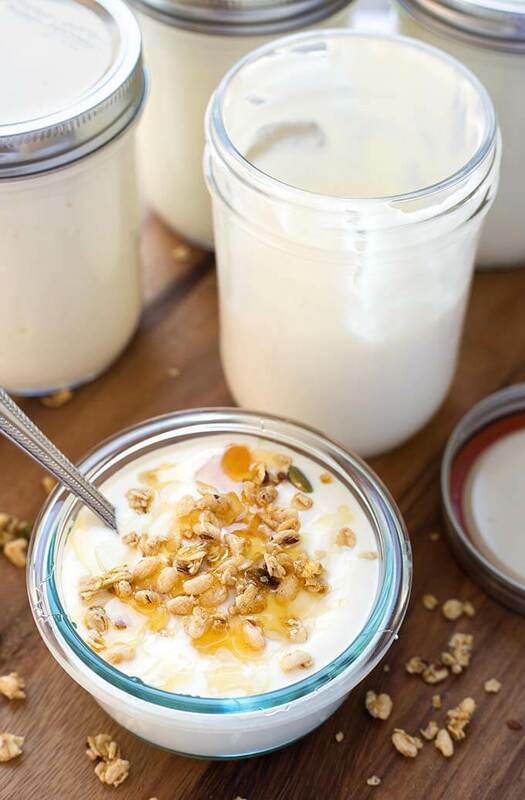 Instant Pot No Boil Yogurt, also known as Instant Pot Cold Start Yogurt, is a thick, creamy yogurt that you can make faster than the boil method. Electric pressure cooker yogurt uses a yogurt setting that is built in, to make it easy, with no babysitting required! And did I mention that this Instant Pot yogurt is delicious?! 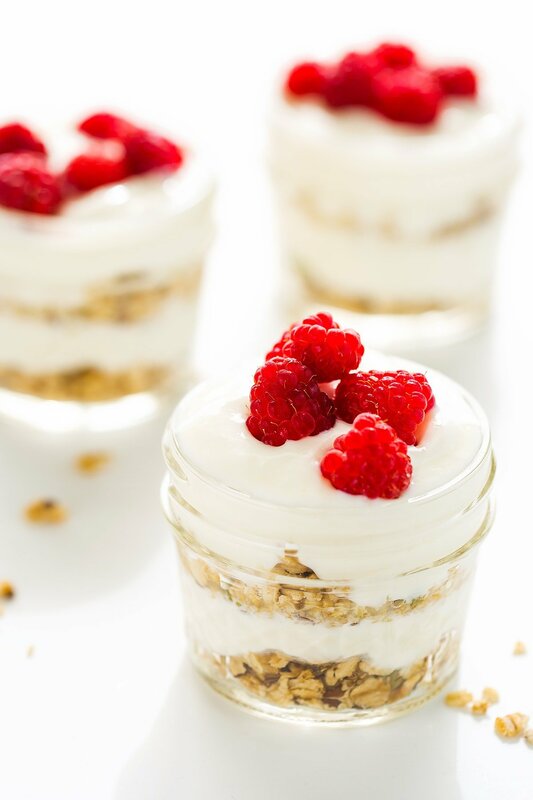 Making yogurt is something I never did until I bought my first Instant Pot® electric pressure cooker. I used the boil method, where you heat the milk to 180, cool it to 110, then add the starter (yogurt), then incubate for 8+ hours. It’s not hard, and you can use regular milk. It comes out a little thinner than the “cold start” or “no boil” method. It is still good though! 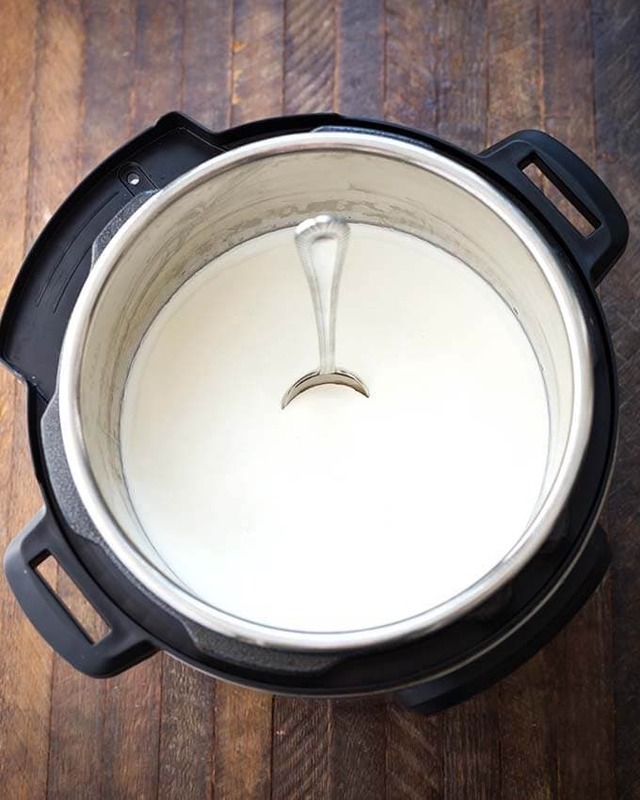 When I first made Instant Pot No Boil Yogurt, I was thrilled, as this method appealed to my lazy side, and it came out thick enough that I didn’t have to strain it (another point for my lazy side)! Not having to boil & cool it meant that I saved time, too. 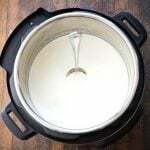 Instant Pot No Boil Yogurt, or sometimes called “Fairlife yogurt”, “Cold Start yogurt” or a loose version of Vietnamese yogurt, comes out creamy and thick. This version of Instant Pot Yogurt uses a milk that has already been boiled and is filtered. There are several brands out there, but Fairlife® is by far the most popular. It comes in whole, 2%, and nonfat. Use ultra pasteurized milk, such as Fairlife® – You can use whole, 2%, etc. The reason you can get away with not boiling it for this method is that they already boiled it. The milk gets heated enough to kill the bacteria that fights against the cultures that make the yogurt. That’s why you have to add starter with active/live cultures. Add a starter with active/live cultures – You need a starter (I use Fage yogurt), since all of the live stuff was killed off in the boil. Just whisk it in. I use 2 heaping Tbsps for 1/2 gallon of milk. Make sure it’s fresh, and actually says “Active Live Cultures” on the carton. Sweetening your yogurt – Completely optional. Sometimes I do, and use a can of sweetened condensed milk, whisked in well. Sometimes I don’t want a sweet batch, or I just don’t have the SCM, so I leave it out. I like to use honey and vanilla when I serve it. 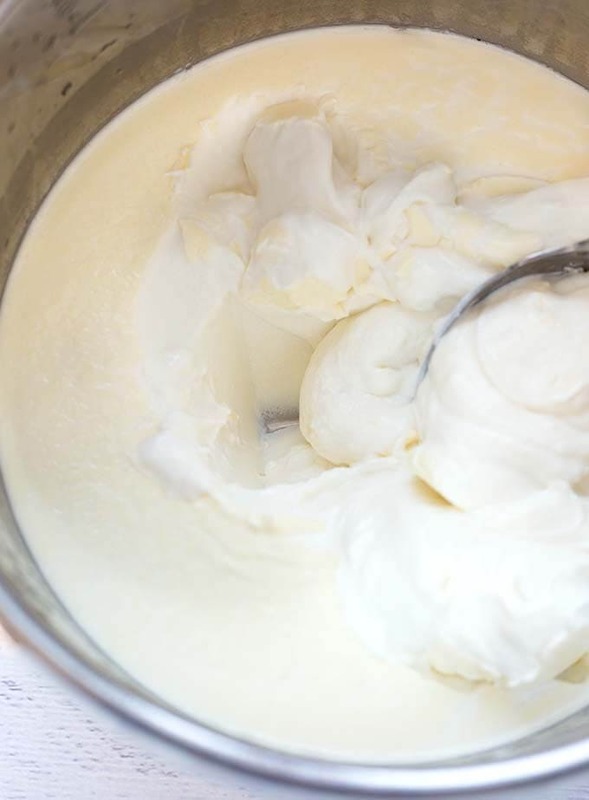 Heavy Cream – Sometimes I add a cup to make my yogurt even creamier. Totally optional (and so decadent!). 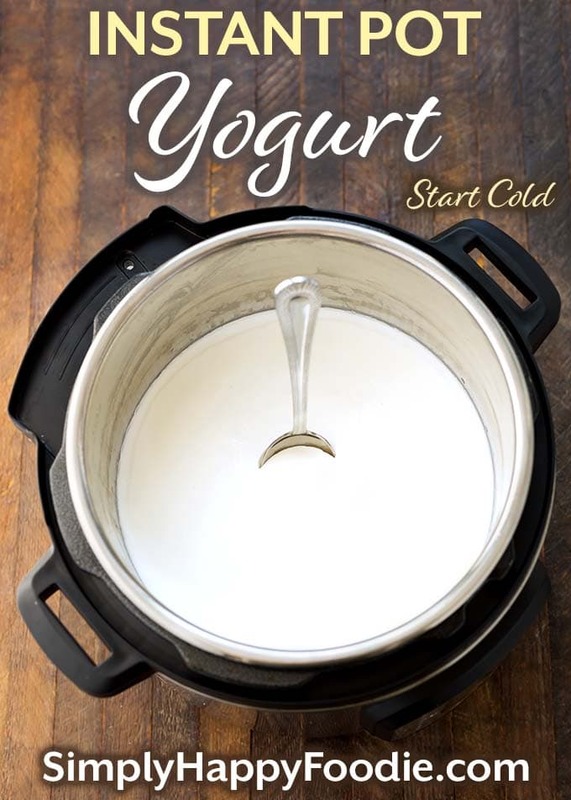 Instant Pot No Boil (cold start) Yogurt is thick, creamy, and delicious. Pressure cooker yogurt is fun to make and tastes so good! Pour 1/4 of the milk into the inner liner (stainless pot). Add 2 heaping Tablespoons of the yogurt starter (I like to use Fage brand). Whisk to incorporate completely. Add sweetened condensed milk (if using), and whisk very well to dissolve and combine. Add the heavy cream and vanilla (if using) and the remainder of the milk and whisk well to combine. Place a lid on the pot. You can use the IP lid (on venting), a glass lid, silicone, a dinner plate, etc. Press the Yogurt button (or dial), and set time, using the + or - button, or dial, for either 8 hours (default) or 9 hours (for a more tart flavor). Longer incubation time equals tarter yogurt. When incubation time is finished, cover the inner liner with a paper towel, and a lid over that, and place it in the fridge to chill. Do not stir until chilled, for best results. Remove from fridge and stir. Yogurt should be nice and thick. If you want it even thicker, you will need to strain it. To strain, place coffee filters in a strainer set over a bowl and pour the yogurt in the lined strainer (or use a yogurt strainer). Place in fridge and strain until desired thickness is achieved. I was so proud when I opened up my pot and saw thick yogurt! Then I tasted it and it was creamy, thick, and sooo good! It was a lot easier than I thought it would be. Thank you for this awesome recipe! Yay! Isn’t it fun? I don’t buy yogurt in the store any more. I’m so happy this method worked for you! Thanks for your review! Hi, I used to make yogurt frequently when my children were little in a yogurt maker, but have never used sweetened condensed milk. (& am not allowed to eat it in my food plan)Mine always turned out well. Have you tried making it w/o scm? Any suggestions w/out adding all that sugar? Hi Linda, the SCM is purely optional. Curious…. Has anyone replace the sweetened condensed milk with coconut milk? The full fat kind. There are people who make coconut yogurt. I don’t have the exact recipe. My first attempt at yogurt was a fail (not your recipe/method). I don’t have a yogurt button. Last night I used your method and I was SO EXCITED to find thick yogurt this morning. Thank you, thank you! Woo hoo! How awesome, Angela! So yummy! It’s time for me to make another batch. Thank you for letting me know! I think only an Instant Pot user understands that level of excitement over homemade yogurt! Enjoy! The porridge button is for oats and grains. Will this method work for regular pasteurized milk? My understanding is that you want ultra pasteurized milk. It has already been boiled, so that’s why you can skip that step. Is there a trick to getting the thick yogurt with just the instant pot? I followed your instructions and when the timer went off after 8 hours I had liquid, runny yogurt 🙁 I put it in the fridge to see if it would thicken, but I was really hoping this method would work! I have the yogurt button and I put in organic ultra pasteurized milk and hit the button. Do I need to bring it up to 110 degrees beforehand or are there any other pointers you can give me? Hi Steph, I can’t say why your yogurt didn’t get thick. I have heard that some brands of organic milk use oil based algae, and that may be the issue. I just learned of this, so I’m not sure. Also things to consider: Was the yogurt starter fresh? Did you use enough? Did you mix it really well? I hope this helps. I use the Fairlife brand, and it works every time. Good to know! I did use fresh starter with 2 overly rounded TBSP. I think I mixed it well but maybe I didn’t. I will definitely try it with Fairlife next time! I just used the Walmart Great Value brand organic milk so maybe that has the oil based algae in it. Thanks for your tips! I hope it works. I’ll be adding the tips to my post as I learn them. Who knew?! Please let me know how it turns out. Also, I think adding some heavy cream helps it. It is already ultra pasteurized. I think the Ultra filtered is another think to look for in the milk (not necessarily in the heavy cream). The Walmart does not get as thick. I have tried a couple of other ultra pasteurized milks and they did not get as thick. I strain mine anyway because I use the whey. Just tried this recipe night before last, and it is FABULOUS!! My husband claims it is THE BEST yogurt he’s ever had—and he’s quite a “foodie”/likes to critique too! I used the recipe exactly as you have it here with the Fairlife milk and the sweetened condensed milk and the cream, which I figured out (by entering the ingredients into “My Fitness Pal” app) is about 325 sinful calories PER cup! I’d made apple crisp earlier in the week and my husband voted for some of this yogurt on it last night instead of my homemade whipped cream, and then he claimed THAT was the best thing I’d fed him in years!!! NOTE: I had used my IP with the slow-cook button to do some taco chicken the evening before I made this yogurt and I noticed the taco smell in the liner after my son had hand-washed it. I then cleaned the liner extra well, used an organic (vinegar-based/food-safe) air freshener and the smell was gone. However, when I opened the IP in the morning I could tell it was tainted with taco!! I panicked that I’d ruined it, and discovered that the smell had come from the LID—specifically the silicone seal ring… I put the IP liner in the fridge still to “firm up” and after it cooled I then skimmed off an entire layer off the top (to give to my dog!) and then the next spoonful was ok, so I skimmed another layer just to be sure and it’s GREAT! So my husband just ordered a set of 3 replacement silicone rings for me (for only $13) that are actually all different colors so then I can use one specifically for spicy recipes in the future and another for sweet and another for… Well, for ALL those various flavors Sandy has so well-documented here for us—THANKS!! Hi Jen, It sounds like you and your hubby are an awesome dup when it comes to IP cooking! How great that you both share the Foodie fun! Thank you so much for your review with so much info! You can take the seal out, as yogurt isn’t under pressure! You can use any lid as you are not pressurizing. You can use that lid and remove the seal.. I use a glass lid. I wasn’t watching carefully and my mixture got to 140 degrees so I cooled it back down to 110 and added another heaping tablespoonful… I’m hoping I haven’t ruined this batch! Any suggestions for if it doesn’t turn out? Creamer maybe? Oops! It happens sometimes. You can drink it, as it will still be healthy. You can use it as a creamer, and if it is unsweetened, use it to make a creamy soup or pasta dish. If it is sweetened, you could have it over peaches or a cobbler, or make a smoothie or milkshake with it! Thank you Sandy! This is the first yogurt instant pot recipe that I really liked. I used Aldi’s Organic Whole Milk (ultra pasteurized), a cup of heavy cream, 2 tsp. Vanilla. I incubated for 9 hours. It is the thickest I have ever made but I am still straining it right now. I like really thick yogurt like Fage. Next time I think I will incubate it a little longer. I really appreciate you taking the time to post the recipe. I bought the ingredients for this at the store yesterday and started the process this morning. As I was rinsing the containers for recycling I noticed that the container of Fairlife milk was only 52 oz short of a half gallon. Was I supposed to buy two containers to make up that difference? Have I ruined my first batch of yogurt? It’s okay. That’s the size they come in now. I updated the recipe card. Thank you for your question/comment. It worked, it is delicious, and boy does it make a lot! What a fantastic recipe. And, it couldn’t be simpler! I used organic, grass fed cows’ milk and the yogurt is sooo good. I did strain out the whey because I like really thick yogurt. Also I found a recipe that shows a bit of raw honey drizzled on top and a few walnuts added, too. It is my new favorite treat! I won’t ever buy store bought again! Excellent, Linda! Thank you for letting me know! Honey and nuts on yogurt is such a classic! My Instant Pot Lemon Curd is also amazing on yogurt! Thank you for your review! Oops, I bet it is your picture at the top of the page that gave me the idea of honey and walnuts. Have you made cottage cheese in your IP? I haven’t. Sounds fun though! Hi Barbara, I’ve kept it as long as 2 weeks. It probably lasts longer, but I don’t know how much longer. We eat it daily, so it goes fast! In recording my calories and protein values, do I just use the Fairlife values and 2 tbsp. FAge yoghurt values? Or does incubating change the protein / calories nutritional values? 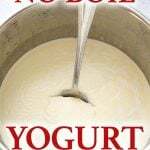 I made my delicious yoghurt according to this recipe, without adding any sweetness and flavorings. Thank you, love this easy recipe and results. I am not a Nutritionist, so I can’t say for certain how much change there is after it becomes yogurt! Great question! Now I need to do some research! Since we sweeten the yogurt in this recipe, is it still good to save for starter? Yes, it’s fine. Many people like to use vanilla flavored yogurt for their starter. Thanks for the recipe. I’m going to try it out tonight. My first attempt was a complete failure. Live and learn though. Do I just leave the pot out onto the stove for 8hrs in a towel wrapped around the IP? Note: Stove will be off. Or does it need to go into the fridge? If you are doing the LUX version, when you wrap it you are trying to keep it warm so it incubates for 8 hours. So not in the fridge. Then put in fridge after the 8 hours. i have the instant pot mini. Would this recipe work by cutting it in half? You make it look soooooo easy. Yes, you could cut this in half with no problem. Maybe only cut the starter by 1/3. Sandy, without the cream, this recipe works just fine in the 3 quart mini. No need to cut it in half. That’s good to know! Thank you, Jackie! If I have the Yogurt function on my IP do I just bring milk to temp of 110-111 add yogurt startet and then set my time w yogurt function? (Skipping the towel step) Love the idea of not having to boil it first and bring back down to 111. I buy Aldi Organic Whole Milk that is Ultra Pasterized. If you have the Yogurt button, just follow the recipe on the recipe card. Not the towel version. Just made my second batch of this yogurt. I used the heavy cream as you suggested and it came out even thicker! This is my favorite yogurt! Hey Barb! I’m so happy you liked this yogurt recipe! I also made a batch with the heavy cream yesterday! Thanks for the review! I have the lux. I was wondering if there’s any way I could make the yogurt in jars directly and not the inner pot? I’m not positive as I haven’t tried it. If I start the yogurt now it will finish in the middle of the night. Am I suppose to sry an alarm clock to get up and refrigerate the yogurt? Can it be at room temp for several hours before refrigeration? Well, I can’t tell you yes, as food safety is important… Would I do it? Maybe. Just know that you can set the incubation time longer, though that may make the results tangier. Hi Beth, how frustrating! It may be that the jars need more incubation time. Also, make sure you whisk it really well. Maybe even add a little more starter (make sure it’s fresh!). I just make mine in the pot. Can you tell me how much yogurt this recipe yields? It says 6-8 servings, but how much is a serving? I do not have a yogurt button and made the no yogurt button last week. It was a fail. I must have done something wrong. I don’t understand the point in wrapping the IP in a towel after the milk has cooled down to 110 because my IP is cold by then and the milk was only 110. Maybe I didn’t let it sit long enough? I think it sat from 9:30-6:30. So sorry to hear that, Kelly. As I said in y article, I haven’t tested this method personally, but my friend always has success with it. I’ll ask her if she ha any ideas for you, then I will update the post, if she does. Hi Sandy! I’ve been wanting to try making yogurt in my IP but my family only likes fruity yogurt, not plain with added fruit (tried it & no one would eat it). Is there a way to make fruit flavored yogurt this way? I’m not sure, but maybe blend the fruit in with the yogurt. Why not add after done. There are some wonderful frozen fruit mixes in the grocery store. Also you could try fruit pie mixes or like canned peaches. I’m so bummed! I don’t have the yogurt button, so I tried your friend’s recipe and after 8 hours, it was pure liquid with a few curdles on the bottom. I used the recommended milk, 2 heaping tablespoons of starter yogurt, some vanilla and some maple syrup. I heated to 110 degrees, turned off, unplugged, set to sealing and wrapped it with a blanket and a tablecloth so it was very, very insulated. It was still warm when I unwrapped it 8 hours later. I’m SO bummed! 🙁 I was really looking forward to some homemade yogurt, and so were my kids! I wish I knew what went wrong! If you keep the ingredients in the same ratio, it should come out fine. Keep cook time the same. How long would you say the yogurt will last? Will be trying it tomorrow. A couple weeks in the fridge. Maybe longer, but mine rarely lasts that long! Today I made the no-boil yogurt. 8 1\2 hrs in my IP and it came out PERFECT. Thank you for this great recipe. I am a newbie with my IP and this is my first major win ! That’s wonderful, Lonnie! I’m so glad it worked for you! Hi Sandi, I want to make yogurt using the no yogurt button as I have the 3qt lux mini. My question is when do I add the sweetened condensed milk and vanilla? Add the SCM in the beginning. Be sure to whisk thoroughly. Add the vanilla after chilling. You can do it either way. I think straining as it is chilling avoids an extra step. I have been using this recipe for a few months now and actually have to make it about once a week. However I add the vanilla at the beginning when I am whisking everything together and when done strain it in a Nut bag before chilling. My IP the yogurt button is for 9 hrs then I strain for 2 hrs. As a side note I save out approx 4oz of one batch to use as a starter for the next batch. Would love to try this with ultra pasteurized chocolate milk. Ant tops or ideas? I haven’t tried it, so I’m not sure. It sounds like a fun experiment. You may need to incubate it longer. I’m going to try 9 hours. I did 8 hours last time with white milk and made the mistake of stirring it after the 8 hours and it didn’t get thick. Can you use fat free Fairlife and fat free yogurt in this recipe? I’m waiting on my first batch right now using full fat Fairlife and yogurt, but would like to cut the fat and calories, if possible. I have not used it, bit I have heard that it does work. Is it a problem to use more starter yogurt? (more than two heaping teaspoons?) Will that help it be thicker? I like it thick and tangy! I don’t know as I’ve never tried it. Anyway to make this without a yogurt button?? There is, but it wouldn’t be cold start, and you would need to use regular milk, not the ultra pasteurized. How fresh is fresh for the starter yogurt. I made my first batch of SCM yogurt in my instant pot and it was delicious. My starter yogurt was a little bit larger than the single serving size, so I am wondering if after it is opened is it good for 24 hours or 2 days maybe? I didn’t want to throw it out if it is still usable as a starter. Thank you. I used a 2 day old starter and it was fine. It may depend on how it is stored. I can’t tell you how many recipes I’ve looked at, before settling on yours. I made IP yogurt and it was tangy and I had to strain it (the boil method). I bought the Fairlife milk, and tomorrow I’m trying it your way. I don’t like tart yogurt, so I’m adding the sweetened condensed milk. I will report back. Great post, great pictures. Thanks! Do you know of any reason not to use the Dulce De Leche Eagle Brand in place of regular SCM in your cold start recipe.. The label says in ingredients: sweetened condensed milk,colour, natural flavour. Thank you. I don’t know. It sounds delicious! Thank you for you very prompt replies to my questions. I tried your recipe, without the heavy cream,because I didn’t have anyon hand. I used the dulce de leche eagle brand, it came out perfect and is delicious,I just wanted to post the results in case someone else may wish to try it. Thanks again. Awesome! I’m so glad it worked for you, Debra! How long does it need to chill? I would like to make drinkable yogurt. Are there some adjustments I can make? I think you need to make the actual yogurt first, then add the fruit or other flavors, and additional liquid of some sort to make drinkable yogurt. I was researching it and this was all the info i could find. Does the heavy cream take the place of some of the milk or is it in addition to the milk? In addition to the milk. I made this yogurt a couple of weeks ago in my power quick pot. It was fabulous. My husband who normally does not like yogurt, loves this recipe for home made yogurt. He even gives me fruit ideas so he can add it to his jar of yogurt. He takes a jar every couple of days in his lunch. I was so happy I gave a couple of jars to other family members… I am making another batch tomorrow morning. Hi Sandy, could I use Danone Activia probiotic yogurt as my yogourt starter.. it has active probiotic culture and active bacterial cultures.. Thank you so much for the recipe. Yes, as long as it has active live cultures! Yes, 8 to 10 hours is a good incubation time. The longer it incubates, the more tart it will get. I do 9 hours and it’s not that tart to me. Instead of SCM can I add raw sugar cane? I would add it after chilling the yogurt. Can this recipe be doubled? Does the time change? Hi Diane, the most I have made at once is 64 oz (1 gallon). The Fairlife comes in a 52 oz bottle, so about 12 oz less. I think you could, if your pot is large enough. You may need to add a little time, maybe an extra hour.